When it comes to choosing replacement windows, vinyl is a popular and highly economic option. If this material is on your short list, you may be wondering how long vinyl windows last. 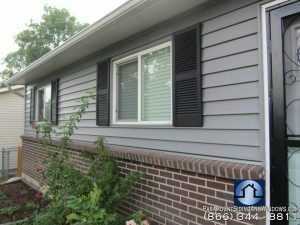 First and foremost, Paramount Siding and Windows in Denver has seen that the “cheapest” option is not always the most financially sound option. Vinyl can fall into that category. Our goal is to find you the best deal on the right windows, doors, and siding for your home, so today we offer our insight to help you make the best possible decision. When it comes to how long vinyl windows last, they don’t generally have the endurance of properly-maintained wood or even metal windows. They do however offer many other benefits that should be considered. Vinyl windows come in a wide variety of designs and colors. They also have good insulation properties and they won’t break your budget. Plus, you won’t have the upkeep that wood windows require. Vinyl’s longevity often comes down to the quality offered by the manufacturer. Some only make basic, builder-grade vinyl windows while others offer fantastic, premium vinyl. Choosing the right product is often a balance of cost, quality and your potential return on investment. The first clue to knowing how long your windows will last is to look at the warranty length. It will give you a good indicator of the expected lifetime of any window. Many vinyl windows carry a warranty of 15 to 25 years. Some go even longer. Just be aware of the fine print which is something we’ll go over with you when helping to select your replacement windows. Typically, if the window is exposed to a harsh climate (like cold Colorado winters), accidentally damaged in a botched DIY job, or doesn’t meet minimum maintenance requirements, the warranty could be void. So, how do you maximize vinyl window life and not rely on your warranty? Take a look at the factors. Long hours of sun exposure can deteriorate your vinyl windows and eventually lead to cracking. To protect your windows from damaging UV rays, use a protective sealant and consider creating shade over your southern facing windows with awnings. In climates with high humidity, vinyl windows can suffer from gradual water damage. Also, sun mixed with low temperatures can lead to condensation and other moisture issues. Either way, fungus and microorganisms can thrive. A protective sealant can help like it does with UV rays. Finally, follow the manufacturer’s guidelines on maintenance. Again, this is far easier than wood. Simply take care of semi-annual cleanings with soapy water and a soft cloth to avoid build-up of dirt. You should also have any damage repaired promptly and by a professional. Proper care will give your windows the best chance of functioning well and looking good for as long as possible. Ultimately, determining how long vinyl windows last is not that cut and dry. It really depends on the manufacturer and often the price point, as well as weather and your maintenance regimen. To find out if vinyl is right for you, or perhaps another option, please get in touch with the team here at Paramount Siding and Windows in Denver. We’ll answer your questions, find the right windows at the right price, then get them installed quickly and professionally.